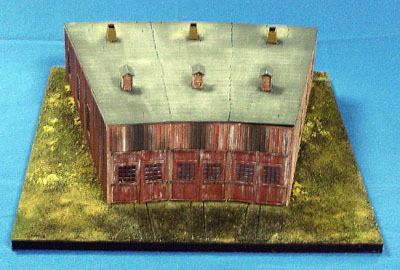 Here are some photos of a model I built several years ago for Bill Banta to use as one of his, "Banta Modelworks," sales display dioramas. 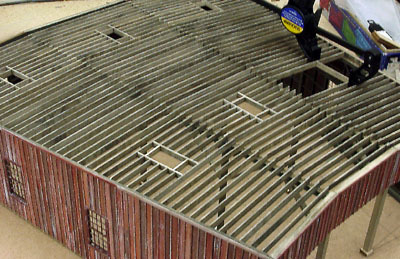 This kit started out with several envelopes of strip wood and five pieces of laser cut side and rear walls which had one surface covered with a, "Peel and Stic" adhesive. 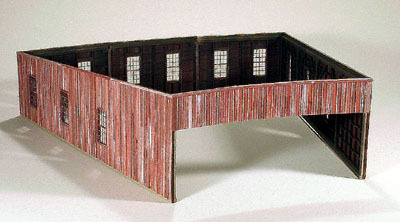 The strip wood for the exterior walls was divided into three equally sized piles and colored with Folk Art Rusty Nail acrylic craft paint in an aluminum photo tray with a 1" wide brush. One third of the wood received straight Rusty Nail, the second third had a few drops of Black added while the third batch received a few drops of Brown Oxide. These same color combinations were also used on the battens and edge trim. When all the reddish colored wood was dry, white paint was dry brushed on one side of all these pieces with a smaller brush. This exterior view shows of one of the side walls before the battens and windows were added. This is the interior side of the same wall showing the excellent laser cut framing. Overall view of the basic structure. The windows have been installed and interior walls sprayed with a dusting of Floquil Grimy Black. 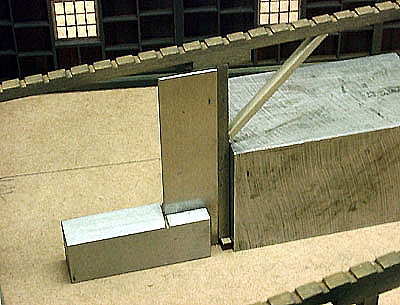 A small machinists square and a square block of steel were used to keep the interior columns vertical as the glue set. A piece of 1/2" Gator Board was used as a base because of its light weight and strength. The center beams have been added along with their supporting columns and braces. The process of installing the roof rafters has begun. Here's an overhead view of the rafters being installed. 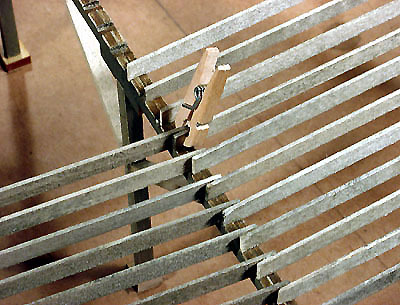 Tiny clothes pins were used to obtain a solid glue joint. The engine house is starting to come to life as seen in this low level view of the interior showing the beams, braces and some of the rafters in place. All the rafters are now in place. I used the three roof pieces to determine where the holes and frames for the six exhaust vent structures would be located. Small pieces of paper were glued to the rafters to help in this process. 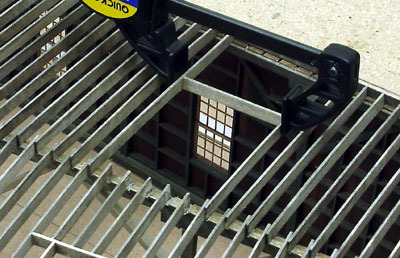 If the roof was going to be attached permanently, the time consuming process of modifying the rafters to create these openings could have been omitted, but since was going to be a display model, I decided to take the time and effort to put them in because they added much to the rafter design. Five in, one to go. I used small, "Quick-Clamps," to help in this phase of the project. Here's a closer view of one of the vent frame elements being held in position while the glue sets. After all the rafter and vent hole components were installed, a 50:50 mixture of white glue and water was used to reinforce each rafter and vent frame joint. 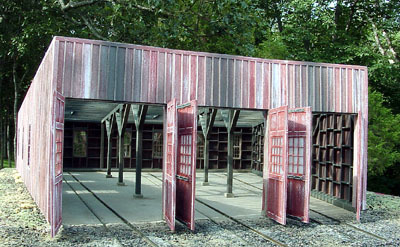 At this point, I realized that the building was sitting too low and the bottom edges of the doors would not clear the rail heads. To raise the base of the foundation up to rail head level, I carefully slid a razor blade under the foundation boards, removing the structure from the Gator Board base. Small pieces of bass wood were glued to the Gator Board where the foundation had previously been attached. 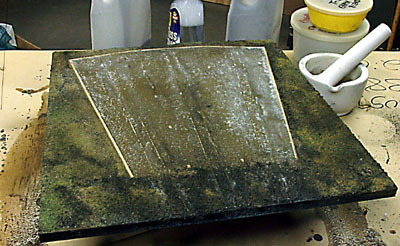 To prevent the scenery glue and water from loosening them, they were painted with Polyurathane. When dry, the structure was glued on top of the bass wood pieces. Eight small pieces of wood were also glued where the vertical support beams would be located. 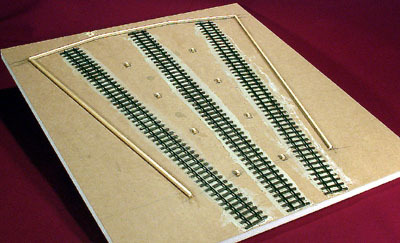 Three pieces of Tomalco Sn3 weathered track were attached with Liquid Nails for Small Projects. 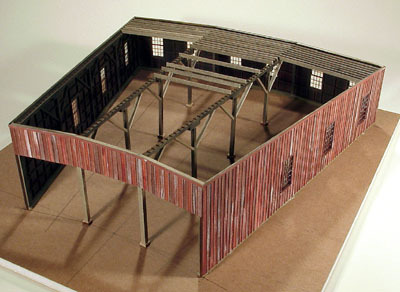 The model base was now ready for the addition of an interior floor. The interior floor is a mixture of dirt from my garden, ground up limestone rock and white glue. The ground cover around the building is composed of more dirt, Chama, CO. cinders and Woodland Scenic ground foams. 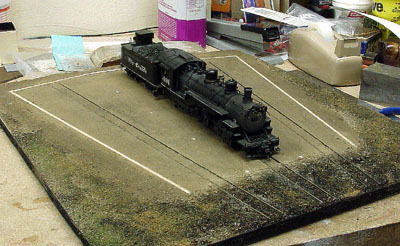 I decided to place my first Sn3 locomotive, Engine #491 on the center track to see how things looked. 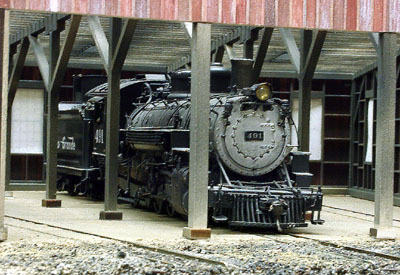 With the building now securely fastened to the base, I couldn't wait to place Engine #491 inside for another photo. 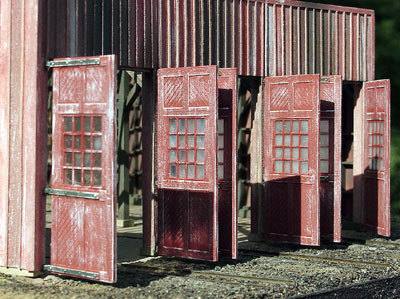 Grandt Line "O" Scale door hinges were fastened to the doors with CA adhesive which were then used to determine where the bent wire hinge supports, made from brass wire, would be located. 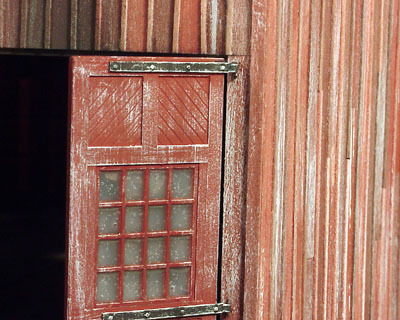 With the doors in place, they can be easily opened and closed with the touch of a finger. 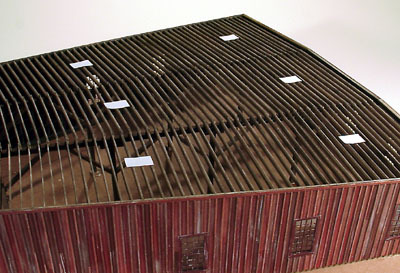 This is one of three ventilators for the front portion of the roof. 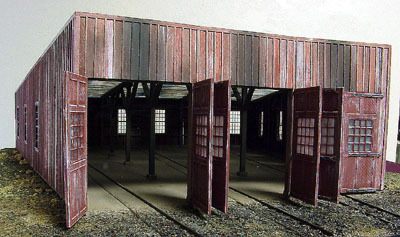 Once assembled and dry brushed, they were glued into their locations on the roof panels. 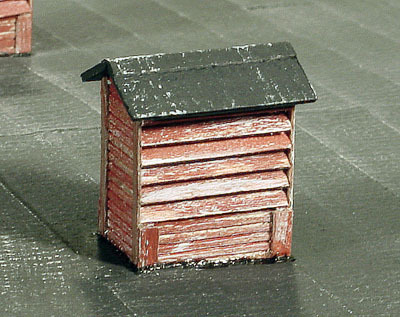 5-minute epoxy was carefully placed around their bases and painted with glossy black paint to represent roofing tar. 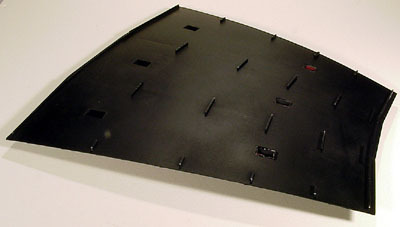 This view shows the underside of the roof component. The small pieces of strip wood serve as locating tabs to help keep the it in place and properly aligned. The almost completed building is shown here using the trees in our back yard as a backdrop. All the doors are swung open for this view. The roof has been placed on the finished structure for this photo and all the ground cover is in place. 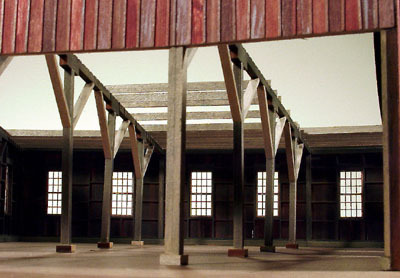 Because of the intricate detail of the rafter design, this building really needs to be positioned on a layout so that the interior can be seen. All that's left to do is close the doors and get this structure ready for shipping. 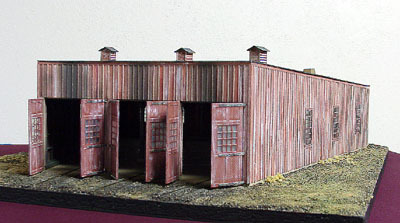 Now that the engine house is complete, it can be carefully packed and shipped to Banta Modelworks.